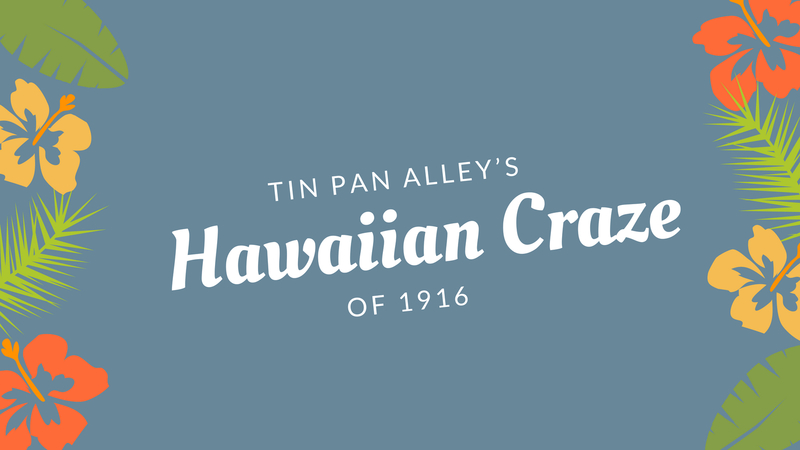 In 1916, during Tin Pan Alley’s “Hawaiian Craze”, Mele Kalikimaka was indeed the thing to say! George Gershwin spent his teenage years, from 1914-1917, cutting his teeth as a song plugger for the publisher Jerome H. Remick & Co. in Tin Pan Alley. In the early twentieth century, Tin Pan Alley was the hotbed of American popular song composition, churning out hit after hit by composers Gershwin admired. Many successful composers, like Irving Berlin and Jerome Kern, had similarly begun their careers as song pluggers or house pianists. Tin Pan Alley songs are notorious for their use and appropriation of other popular musical styles, like ragtime – Remick’s had one of the largest catalogues of rags which perhaps helped Gershwin get the job: he was an excellent rag pianist. Another appropriated style was the so-called “Hawaiian Craze” of 1916 during Gershwin’s tenure at Remick & Co. Their catalogue included several novelty pieces, such as Henry Kailimai’s “My Honolulu Uklele Baby” and Richard Whiting’s “Along the Way to Waikiki.” Similar to Tin Pan Alley’s ‘skimmed off the top’ use of ragtime, these songs only pastiched Hawaiian culture – and at times outright mocked it – making them problematic pieces of history. While patriotic pieces replaced these novelty songs after America entered World War I, some of these songs would resurface during the Second World War as American GIs traveled to the Hawaiian Islands and the South Pacific. Pollack, Howard. George Gershwin: His Life and Work. Berkeley: University of California Press, 2006.